• Features a black solid steel deck for moving small items. • 10" Pnuematic Wheels are a smooth ride over rough terrain. • Converts into a platform in seconds. • Wheel guards to protect items from getting into the wheels. 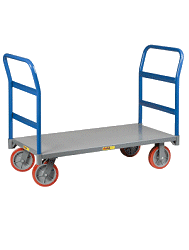 • Large 800 lb capacity for heavy items. • Rugged tubular steel construction. • Milwaukee is the brand professionals trust! Made in the U.S.A. Wheels: Pnuematic / 10" x 4"
Nose Plate: 7.5" X 14"
Platform Size (in x in): 12" X 36"
We use this handtruck to transport boxes of sales collateral. We like the solid base. It is very handy and durable.